Pipían or Pepian, as some people call it, is a type of Mexican sauce which the main ingredient are pumpkin seeds, in Spanish these are call “pepitas” that is where the word “Pipian” comes from. The sauce has a similar consistency to mole, you can get Pipian sauce already made, but nothing beats the fresh homemade one, it is not a difficult recipe to make and the flavour is amazing. Usually pipian is eaten with chicken, but I used mackerel and had a salad with it to make it a bit lighter, traditionally chicken Pipian is served with Mexican rice and refried beans. First roast the pumpkin and sesame seeds on a frying pan on medium heat for 5 min. Then roast the poblano or green peppers on the stove top burners until completely blistered and charred all over. Wrap the peppers with a tea towel and place them in a plastic oand let sit for around 8 min, this will make the peppers sweat, making the skin peeling easier. Peel the charred skin and remove the seed and stem. In the meantime cook the tomatillos and serrano chillies in a medium saucepan with just enough water to cover them (if you are using tin tomatillos, only cook the Serrano chillies). 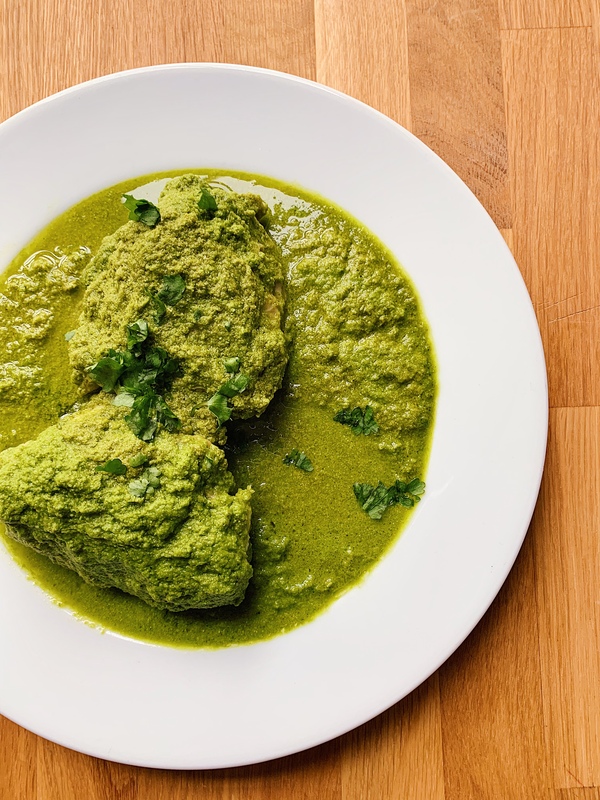 Then place the peeled roasted poblano peppers, tomatillos, Serrano chillies, onion, garlic, cilantro, green pumpkin seeds, maseca flour, sesame seed, and chicken stock into a blender and puree until smooth. Then heat a frying pan on medium heat and add 2 tbsp of oil, pour in the sauce, add salt to taste stir from time to time and cook for around 15 mjn until the sauce has a consistency of heavy cream. If it’s too thick, add more chicken broth until you get the desire consistency, turn the heat off and set aside, ready to be serve with the mackerel fillets. While the sauce is cooking, fry your mackerel fillets. Heat a frying pan on medium heat and add the oil, once the oil is hot, place 2 mackerel fillets at a time, skin down, push the fillets down with a spatula (this will avoid the fillet to curl up), fry them 3 to 5 min on each side. 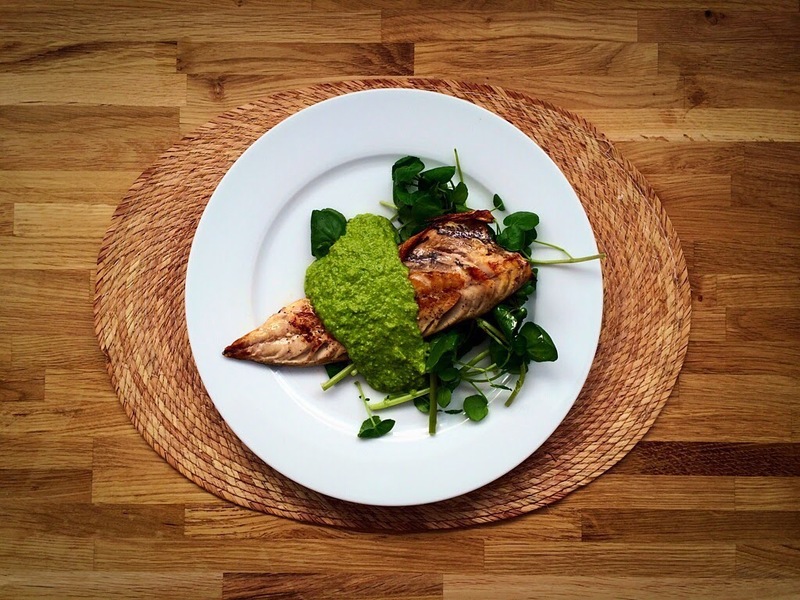 Serve some watercress salad on a dinner plate, place one mackerel fillet on top of the salad and pour some green Pipian on top of the fish. You can get fresh tomatillos and poblano peppers from cool chile, they sell them when the tomatillos and poblano peppers are in season. If you can’t find these ingredients fresh then get the tomatillos in a tin, you can find them in www.mexgrocer.co.uk and use green peppers instead of poblanos.